Sooner or later, it was bound to happen: Grassroots elements in the secular and traditionally Iraqi nationalist Iraqiyya would feel unhappy about the ever more intimate ties between their own leadership and the Kurds. In an unprecedented expression of dissatisfaction with the course of Iraqiyya leader Ayyad Allawi, no less than 19 parliamentary deputies that are either part of Iraqiyya or have recently defected from it expressed their support for Prime Minister Nuri al-Maliki yesterday by signing a declaration of solidarity with his policies towards the Kurds. The declaration criticizes the current political crisis for being fabricated and alleges that accusations about “dictatorship” should more properly be addressed to Kurdish leader Masud Barzani, who has ruled for several decades. The highhandedness of Kurdish security forces (peshmerga) and secret police (asayish) in disputed territories in northern Iraq is highlighted as an area of particular concern. It is worthwhile taking a look at the identity of the signatories. Almost all of them are Sunnis from various parts of northern Iraq, including Kirkuk, Nineveh and Anbar. In terms of bloc affiliations, most are either from the recent blocs of Iraqiyya defectors (Free Iraqiyya & Wataniyun) or belonging to small lists. But it is noteworthy that there are also a couple of deputies from the Hiwar bloc of deputy PM Salih al-Mutlak and the Hall bloc of Jamal al-Karbuli. Historically, the Kirkuk issue is something that tends to bring Iraqi Sunni and Shiite Arabs and Turkmens together in opposition against Kurdish plans for annexing the city, as was evidenced by the 22 July trend back in 2008. However, thanks in part to US opposition, Maliki failed to mobilise on Kirkuk during the debate of the election law in autumn 2009 and has remained relatively aloof from the situation there until quite recently. Importantly, no less than 12 of these 19 Maliki supporters are still technically reckoned as belonging to Iraqiyya. That, in turn, has implications for the arithmetical exercises being carried out these days about a possible no confidence vote in Maliki. What this means in practice is that Iraqiyya can probably muster no more than a maximum 75 votes in parliament from its own ranks for an anti-Maliki vote – and that is the absolute maximum given the poor track record of many Iraqiyya MPs in terms of parliamentary attendance. In other words, even if the 40 or so Sadrists deputies should after all go all the way and join the Maliki critics in a move to sack him (a big if), there would be trouble garnering the required 163 deputies needed for an absolute majority (the Kurds command somewhere between 43 and 57 votes, depending on the position of independents and minorities). Meanwhile, from Beirut, following rumours about a possible rapprochement with Maliki, Mutlak himself cannot quite seem to make up his mind whether he truly does regard the Iraqi prime minister as a “dictator” or not. Maybe he and other Iraqiyya leaders should spend less time making statements from locations far away from Baghdad and instead spend some more time with their constituencies in northern Iraq. If not, they themselves – rather than Maliki – may end up as the main casualty of their current campaign to unseat him. What is nominally the second partnership-government of Nuri al-Maliki can increasingly be described as a minority government of his own Shiite Islamist State of Law bloc relying on ad hoc support from other players including the Kurds, Sadrists and White Iraqiyya. The outcome of tonight’s high-level meeting of political leaders in Baghdad suggests that Maliki’s apparent strategy of proceeding with the slimmest possible parliamentary support base could in fact be working. The main issue at today’s meeting appears to have been conflict over the agenda. It had originally been envisaged that the meeting would address such issues as the security ministries, the proposed national council for high policies, and more broadly the future of the “Arbil framework” that led to the formation of the second Maliki government in December 2010. However, Maliki apparently managed to turn the meeting into a more limited discussion about the parameters of the US “instructor” presence after 31 December 2011. On this issue, the meeting concluded with a formula that apparently gives Maliki what he wants: There will be instructors but they will enjoy no special legal immunities. Maliki will be able to sell this arrangement to his constituency in the same way that he sold the SOFA agreement in 2008, arguing that by appealing to the values of nationalism it is possible to squeeze the Americans: In 2008, the Bush administration pushed for a long-term arrangement and ended up with a 3-year withdrawal plan; in 2011 the focus is on mere “instructors” and Maliki will apparently not give the Obama administration what it wants in terms of legal immunities for those instructors. No agreement on numbers was reached at today’s meeting. In terms of politics, the significant development today was the withdrawal from the meeting of two Iraqiyya leaders, Ayyad Allawi and Tareq al-Hashemi, apparently in protest against the more limited agenda. The lone protest by Allawi and Hashemi in turn symbolises the problems of the opposition to Maliki. At least four Iraqiyya leaders (Usama al-Nujayfi, Salman al-Jumayli and Salih al-Mutlak plus Arshad al-Salihi of the Turkmen Front) must have remained in the room after Allawi and Hashemi left. Maybe the recent visit to Iran by Usama al-Nujayfi and the rumours about friction between him and Allawi has played a certain role? Similarly, the participation at the meeting by Qusay al-Suhayl (Sadrist) and Muhammad al-Hashemi (representing ISCI) signifies the reluctance of those forces to challenge Maliki, despite the widespread assumption in some Iraqiyya circles close to Allawi about their willingness to do so. Significantly, too, there was no word about any Kurdish withdrawal. As expected, White Iraqiyya participated. What this all means is that the repeated calls from Iraqiyya for fresh elections are unlikely to go anywhere. If Maliki should get into trouble with the Kurds, as some recent parliamentary defeats might suggest, he can probably rely on elements from Iraqiyya that are critical of Allawi as far as oil and gas legislation and Kirkuk are concerned anyway. More probably, though, Maliki may seek to continue to defer decision on these contentious issues as much as possible until such time that he believes his own State of Law coalition can win a parliamentary election and form a smaller majority government proper. The recent terror attack at Nukhayb in Anbar province killing several Shiite pilgrims en route to Syria has deeper political dimensions. First there is the jurisdictional issue. Shortly after the incident, a security force from the neighbouring governorate of Karbala crossed the provincial border and detained a number of alleged suspects who were then taken back to Karbala for questioning. This prompted loud protests from politicians in Anbar who complained there had been a breach of jurisdiction since Nukhayb lies within the border of Anbar governorate. Second, there are some more fundamental territorial questions related to the recent altercations between these two Iraqi governorates. Since at least 2005, various Shiite politicians – in particular the Islamic Supreme Council of Iraq (ISCI) and Ahmed Chalabi but also local politicians in Karbala close to Prime Minister Nuri al-Maliki – have claimed that the territory of Nukhayb should be “returned to the governorate of Karbala”. Subsequent to the recent attacks, those claims have been reawakened. By way of example, Abd al-Hadi al-Hakim recently called for the “return of Nukhayb to Karbala as it was before the former regime transferred it to Anbar”. The Karbala claims to Nukhayb rest on shaky historical foundations. 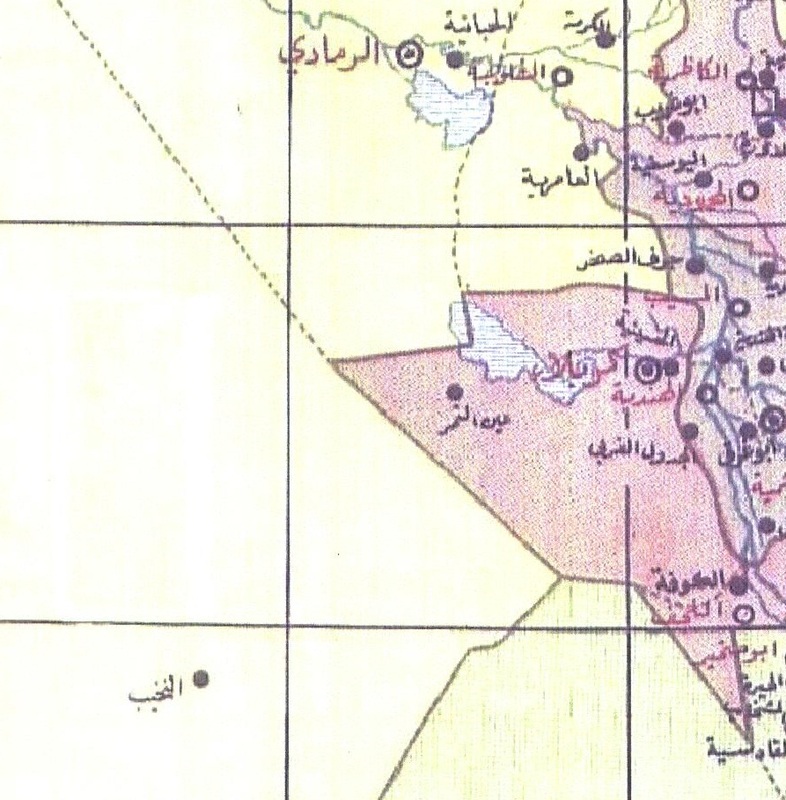 It is true that for a short period in the 1970s, Nukhayb was transferred to Karbala by the former regime (it can be documented that it was part of Ramadi in the 1960s) and then transferred back again in 1979. But for the overwhelming part of the twentieth century, Nukhayb has been administratively affiliated with Ramadi (or, before that, with the special desert police force) rather than with Karbala. More fundamentally, the Nukhayb claim relates to the much bigger issue of “disputed territories” that threatens to polarise Iraqi politics along ethno-sectarian lines in years to come. This vexed idea of collective ethno-sectarian entitlement to land (as distinct from the right of individuals to seek redress for misdeeds and confiscations of land by the former regime) was unfortunately included in the US-sponsored Transitional Administrative Law in 2004, from where it made its way into the current Iraqi constitution. Exactly like the Karbala claim to Nukhayb, many of the claims under the “disputed territory ” heading have scant historical basis, but if granted, they could set the stage for a perpetual debate about real and imagined “disputed territories” across Iraq in the next years. So far there are some positive signs that Prime Minister Nuri al-Maliki is trying to rise above the claims of his partisans in Karbala in the Nukhayb case and will work for the transfer of those arrested to Baghdad and indeed for the release of some of them. The more important question is however this: Will he have the guts to come out loud and clear against the murky attempts by other Shiite Islamists to play the opportunistic territorial card in Nukhayb? 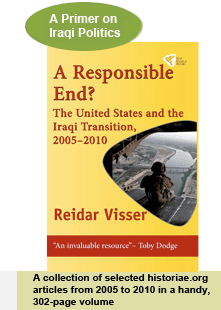 Can US Aims in Iraq Be Squared with a Discourse of Iraqi Sovereignty? It has been long in the making but finally there are more specific signs that Prime Minister Nuri al-Maliki is beginning to publicly articulate a vision of a post-2011 US presence in Iraq that can fit with his own avowed aim to be an Iraqi nationalist. Importantly, after his recent meeting with the new US defence secretary Leon Panetta, Maliki was talking about “instructors” or “trainers” (mudaribun) and not advisers (mustasharun), or, for that matter, regular troops. Historically speaking, “advisers” would be a major problem given the chequered legacy of the British in Iraq during the mandate and in subsequent decades, where it was precisely the popular hatred of the advisers (and the connotations of their immense political influence) that played a key role in unseating the monarchy in 1958. Similarly, regular forces or the presence of military bases would also be at obvious variance with a discourse of Iraqi nationalism. The areas in which Maliki envisioned US training assistance included border surveillance, logistics and intelligence capabilities. This is actually a discourse that can fit in with a notion of Iraqi sovereignty: The US is considered an undisputed world leader in many of these areas; hence, to ask for assistance from a global superpower in these specific areas would not harm the idea of Iraqi independence in the same way that the “advisers” of the British mandate did. Contrast this with the prevailing themes in the Western debate about Iraq. “Absence of external defence capabilities” is a recurrent term. And while this is probably true, as long as it is presented as a general issue rather than broken up into digestible and specific areas that can be singled out for cooperation with the US (preferably technology-related), kneejerk nationalist reactions are likely to prevail in the Iraqi parliament. Similarly, many Western commentators like to highlight a US peacekeeping role in and around Kirkuk. This is also something that is susceptible to Iraqi nationalist criticism, because it is a kind of narrative that fits so well with the standard conspiracy theory to the effect that foreigners are plotting to keep the Iraqis divided in order to justify their own continued military presence. If Arab-Kurdish tensions around Kirkuk are used as a key argument for extending a US presence in Iraq, each bomb that goes off elsewhere in the country may soon be blamed on a US scheme to pit Sunnis against Shiites so that they can extend the American presence in the oil-rich areas in the south. The challenge for Washington is now to find out whether the parameters defined by Maliki – with an emphasis on “instructors” – can meet its own aims in a context where a straightforward SOFA renewal is becoming increasingly unlikely. Maliki seems to be aiming for a military presence that is so low-key that the anticipated parliamentary debate about the SOFA can simply be circumvented. For their part, the Iraqis still need to agree on a new minister of defence. PS: Today’s vote in parliament to “support a reduction of the number of ministers in principle” is a non-issue. The real challenge is to actually do it and not least negotiate the constitutional modalities relating to such a move (i.e. the rules for dismissing a minister). One sentence in an interview with Al-Hurra by parliament speaker Usama al-Nujayfi – a leading member of the Iraqiyya coalition – has created a wave of reactions in Iraq. In the interview given at the conclusion of his visit to the United States, Nujayfi alluded to the possibility of a “Sunni separation” from Iraq unless there was improvement in the political situation. Although there have been growing calls in the Sunni-majority areas for territorially based concessions over the past year or so – many demand more rights for the governorates and some call for the establishment of federal regions – Nujayfi’s hint about a possible fully-fledged separation “of the Sunnis” is unprecedented. Firstly because separation in itself is rarely alluded to by others than the Kurds, and even they like to be a little circumspect when it comes to using that term. Secondly, the idea of combining the Sunni-majority governorates to a single “Sunni region” is not consonant with the limited pro-federal activity that has taken place over the past year, which has been mostly governorate-focused (as in the cases of Anbar and Salahhaddin). Indeed, any would-be Sunni separatists would face exactly the same problem as ISCI did in 2005 (and as Amin al-Charchafchi in 1927) when they tried to conjure up images of some kind of Shiite region: What should they call the new entity? Because exactly like ISCI’s “Region of the Centre and the South”, the Sunni region enjoys no historical precedent. Probably the only historical competitor to the concept of Iraq in this area would be the “Jazira region” – in which case Mosul (but not necessarily all parts of Anbar) might try to absorb parts of northeastern Syria like Dayr al-Zur and even Raqqa to carve out a new state. Good luck. It is obvious that many in Iraqiyya are unhappy about the way things are unfolding in Iraq right now, but there must be better ways of addressing this than dreaming up unlikely alliances with ISCI and the Sadrists, demanding a strategic policy council that the Iraqi parliament is unlikely to ever grant them, or threatening with the creation of new states that would barely know what to call themselves.